1 :: Gerrards Cross Golf Club is considered one of the most attractive courses in South Buckinghamshire. Kindly sponsored by Roberts Newby. The River Misbourne runs directly in front of the 1st tee and may well intimidate the challenged player. The rising ground between mid-fairway and the green tends to make the hole play longer than players think. 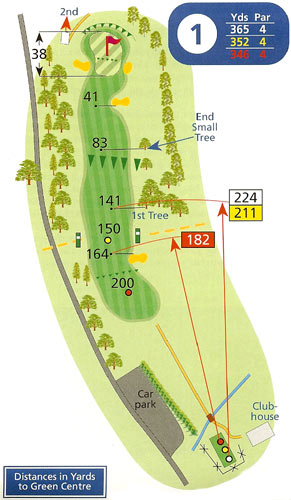 A drive avoiding the bunker on the right side is required to set up a second shot to the two tier green which is probably three-putted more than any other on the course.